Jealous that CIA torturers get all the fun? Want to virtually torture someone right from your own desktop? Want to encourage your kids to see torture as fun and help desensitize them? 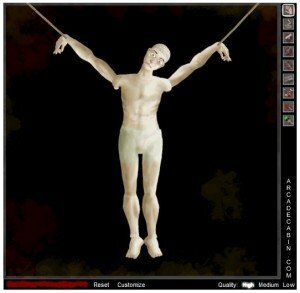 Why not play the torture game, your very own torture simulator! Torture Game 3 is the most up-to-date version of the popular bloody game (rated 8/10!) where you use different tools to torture the victim. You can cut the hands off the victim using a chainsaw saw, you can use a pistol or a shotgun to blow holes in the body, you can even break the body parts apart from the body itself. My favorite: using the Spike tool to tear off flesh. The variety of torture tools that can be found on the right side of the “action border panel” is robust. Why, there’s something for everyone. The most popular tools include ropes, a knife, a shotgun, a razor and of course the chainsaw. While the game loads with a generic male victim’s image, the designers explain you can upload any picture — even your own! — and torture a man or woman you hate. Here’s the link. The game is NSFW. The game runs under Adobe Flash, so you need that on your computer, but otherwise no download is necessary; the game runs right in your browser. There is no cost, no ads, no sign up. Just hit the link and torture. And it is all nice and legal, just like in real life. I wish to God this was satire, but it is not. We are a sick, sick people. But have fun! My “thanks” to alert commenter Pitch for the tip on this game! Meanwhile, I think I’m going to row the USS Absurdity gently down the stream. bartender..give me a bottle of DREAMS, and a shot of 100prf Absurd. Video games? Torture is meant to be a reality show.